Those who’ve been through Windows previews in the past have learned to approach their test setups with a certain amount of caution, if not downright trepidation. That’s because MS has traditionally blocked the simple upgrade path from technical previews/betas to final releases, as denoted by the version that gets released to OEMs for installation and delivery after the GA date, and to MSDN and other online release repositories for licensed customers around 30 days prior to general availability. Though there are usually registry hacks promoted to permit upgrades to occur unofficially, the lack of an official path means that tech support can’t help with problems that occasionally occur when trying to upgrade outside the official upgrade source OSes. 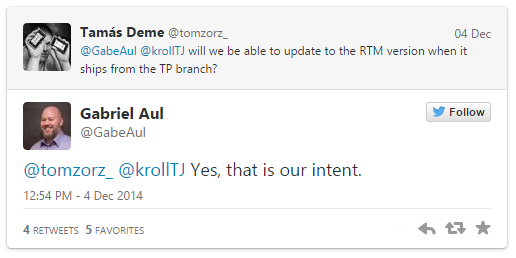 MS intends to provide an upgrade path from the Technical Previews to the RTM version: will that actually happen? Hope so! Aul is pretty careful with his language, but it’s clear that this is something MS will try to include amidst the many other new features and changes that Windows 10 will bring to the embattled desktop OS side of “Windows world” next year. It should be interesting to see if this comes to pass, and convenient for those who’d like to keep their test installations up and running after the preview phase ends, and the latest and greatest Windows desktop OS becomes officially available.